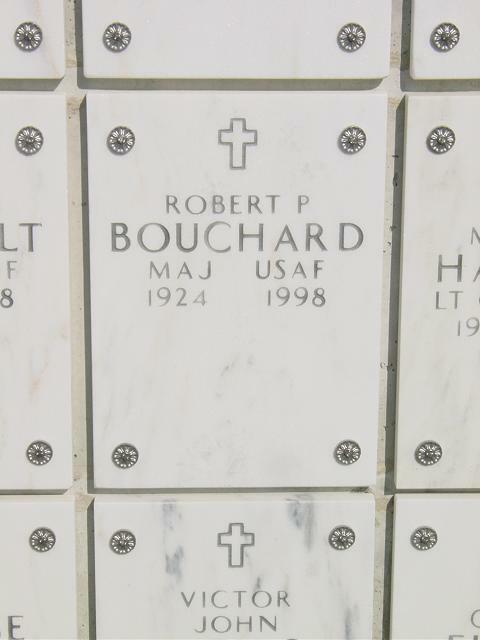 Robert P. Bouchard, 73, a retired research analyst and political and economic specialist who was posted by the Central Intelligence Agency to Europe, South America and Africa, died of cancer September 18, 1998 at his McLean, Virginia, home. Mr. Bouchard retired in 1974, after 24 years with the agency. He was a native of Caribou, Maine. He attended George Washington University and was a graduate of the University of Maine, where he did graduate work in English. Mr. Bouchard received a doctorate in political science from the University of Brussels. He was a flying instructor in the Army Air Forces during World War II and continued serving in the Air Force reserve. He was a director of the McLean Citizens and Stoneleigh neighborhood associations and was a member of St. John's Catholic Church in McLean and the Maine State Society. Survivors include two sisters, Lillian Y. Wark and Nancy B. Day, both of Caribou. On Friday, September 18, 1998, ROBERT P. BOUCHARD, of McLean, VA, brother of Nancy Day and Lillian Y. Wark, both of Caribou, ME. He is also survived by many nieces and nephews. Graveside services with military honors will be held on Friday, October 16, 1998 at 9 a.m. in Arlington National Cemetery. In lieu of flowers, contributions may be made to the American Cancer Society of Northern Virginia, 418 S. Washington St., Alexandria, VA 22213 or St. John's Catholic Church, 6420 Linway Terrace, McLean, VA 22101.